click: Reveal the top 3 cards of R&D. Secretly choose 1 to add to HQ. Return the others to the top of R&D, in any order. For 1 and having to reveal cards from HQ you get to see the top 3 cards of HQ to fetch one of them and reorder the other two. The rez cost isn't the painful bit, it's cheap. Having to reveal cards is however unpleasant if you're playing a traps deck as it gives the runner a lot more info to work with. Because you still put the other cards back on R&D immediately clicking again for the Dome only gets you one new card. If one of the two cards you already saw is something you want to draw it's a good deal, if you're hunting for a different card it's inefficient. Should you wait until your next turn there will be two new cards you can see of course so if you can keep the Dome up for a longer period of time you will gain a lot of control over your drawing from it. 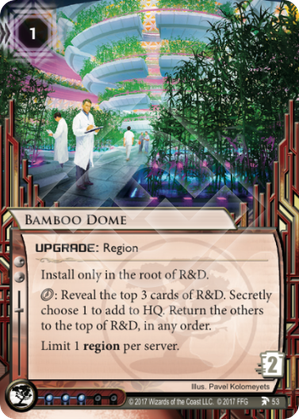 The weakness of Bamboo Dome is that it's only 2 so if the runner gets into R&D and accesses cards the Dome will be trashed. You can of course discourage such an action if you see a Snare! during one of your Bamboo-fueled accesses. Because you reveal the card the runner sees it too and the runner will have to assume you're keeping the Snare near the top of R&D. It's difficult to keep it on top because of mandatory drawing, but even that can be a good tactic to consider if you need to keep the runner out for a turn. And since mandatory drawing does not reveal a card the runner can't be sure the Snare is now in your hand. Aside from delicious Jinteki mindgames Bamboo Dome also interacts with another Jinteki specialty: controlling which cards are where. Think Precognition, Mutate and friends. Whether Bamboo Dome is worth including in your deck is likely to depend on how well you can protect it. If it survives for several turns you can get a lot of mileage out of it.